Security gates can be installed for both domestic and commercial properties, providing safety and security and adding a sense of grandeur to the building. With automated gates, access to your home or business is made much easier as you won’t have to leave your car and they can also be opened remotely from inside to allow guests to enter. Automated gates bring an invaluable level of security to homeowners and businesses, specially designed to prevent the gates from being forced open. Maglocks can also be fitted to the gates, making it even more difficult to break in. and because of their known strength, security gates are often a deterrent in themselves. With automated security gates, coming and going from your property is made easy. The gates can be activated from as far as 20 metres and you can even stay in your home when guests come calling. 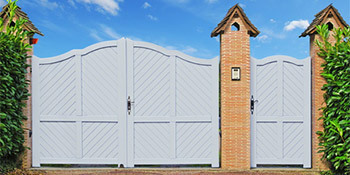 With security gates installed on the front of your property you can add a sense of grandeur. The width and height combined with a wide variety of materials and styles to choose from, ensures you’ll find something that matches both your taste and your property. You may think that security gates are an expensive investment, but prices have shot down and with your property’s security at stake they’re a very worthwhile investment. Of course, cost will go hand-in-hand with the gate’s size and security, but this will be counteracted by the improved protection. Security gates provide a number of benefits to your home but of course, the security and protection they offer is what makes them such a worthwhile investment. For up to four FREE quotes from local, vetted and reputable contractors just complete our quick form below. Project: I have power up to my gate control box, but there is no power going through the circuit board. So I can not operate the gates. Project: i closed it at night and it did not open the next day. i open the box and found a fuse blowen,replased it and it went again. Project: Hi, I’m interested in having an electric gate installed at the entrance of my drive. I’m not sure whether to have sliding or double opening. Project: I have an existing 5 bar gate. It is very old and I am looking for a quote to replace the gate, post and mechanism.